In the name of God, Amen. We whose names are underwritten, the loyal subjects of our dread sovereign Lord, King James by the grace of God, of Great Britain, France and Ireland King, Defender of the Faith, etc. 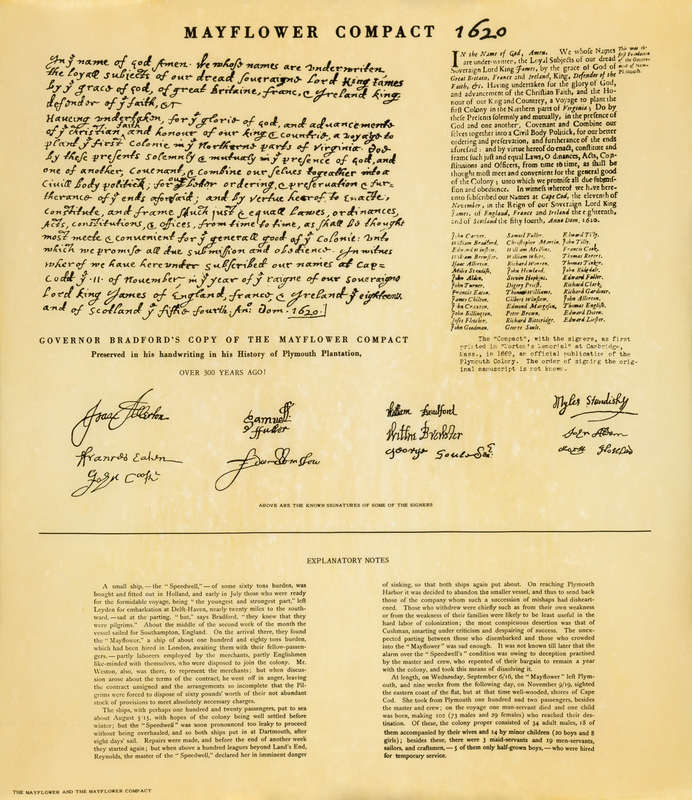 Having undertaken, for the glory of God, and advancement of the Christian faith and honor of our King and Country, a voyage to plant the first colony in the northern parts of Virginia, do by these presents solemnly and mutually in the presence of God, and one of another, covenant and combine ourselves together into a civil body politic, for our better ordering and preservation and furtherance of the ends aforesaid: and by virtue hereof to enact, constitute and frame such just and equal laws, ordinances, acts, constitutions and offices, from time to time, as shall be thought most meet and convenient for the general good of the colony: unto which we promise all due submission and obedience. In witness whereof we have hereunder subscribed our names at Cape Cod the *11th of November, in the year of the reign of our sovereign Lord, King James of England, France and Ireland the eighteenth, and of Scotland the fifty-fourth. Ano. Dom. 1620. *OS The date given here is Old Style (OS) Old Style and New Style (NS) are used to indicate that a date conforms to the Julian Calendar (OS), formally in use in many countries, rather than the Gregorian calendar (NS) which we use today.